Pick up: Colombo Airport or From Your Hotel. Price: Negotiable Usually US$ 30/Person. Colombo City day tour should not be missed, if you visit Sri Lanka. The tour will allow you to explore this once colonial city. 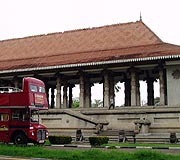 Colombo still boast lot of European monuments and archeological fame buildings. 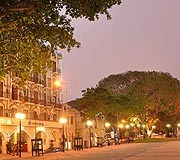 Current Colombo is with the modern day architecture and British, Dutch and Portuguese era buildings, churches and other important structures all over the city. British era old Parliment building, Museum and Dutch churches are some of them. Commercial buildings in the Fort area too should not be missed when you are visiting Sri Lanka on Tours. The Tram routes are gone although still there are vintage cars and double decker buses in running condition. In between your City tour don't miss to drink some King Coconut water to refresh you. There are lot of tasty local foods too available. Colombo don't miss the International fast food chains for your soft drinks and eatery. Select a car or Jeep with us for your travelling with Ceylontusker tours. Call or write us now to book and confirm your Colombo City Day tour with us. The busy commercial capitol is still houses many historical Churches and World War Cemeteries with their original faces. You can find best shopping Centers and Arcades along with finest restaurants and water holes. Lot of interesting people with different habits and faces. Don't miss the opportunity to buy your Gem stones and spicy ingredients which are popular all over the world. This tour is best suited for Transit passengers too when they have lot of time to spend here can go on sightseeing. We can provide Jeep, car or double deck bus for the tour. A/C Transport. Car, Jeep or Mini Coach according to the number of tourists. Entrance Tickets & camera/Video tickets. 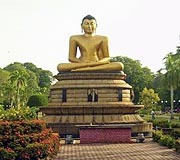 Contact us for to get best Colombo sightseeing offer of ours. The sightseeing tour can made short or extended hours according to your needs and wishes. Even we can arrange a short Golf playing experience in one of Colombo's popular Golf Club. Please Note: Price is negotiable depending on the pickup point along with the attractions you want to see.